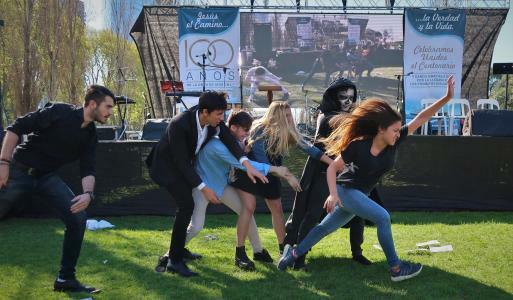 Performing before hundreds of Mennonites and passersby at a park in downtown Buenos Aires, a drama troupe from the Mennonite church in Villa Adelina, Argentina, mimed challenges and struggles facing youth: violence, drugs, promiscuity, greed, and death itself. Representing Argentinian youth, actor Laura Burgos sometimes seemed mesmerized as actors impersonated threats, but she also sought to escape their grasp. A Christ figure in white, played by Diego Gonzalez, rescued her from malice, and came alongside to teach elegant dance steps. Performed in September 2017, the drama was part of a festive three-hour event in Buenos Aires at Puerto Madero, where the first North American Mennonite missionaries arrived in 1917. The gathering featured large-screen videos, children’s programing, special music, poetry, preaching and greetings from other denominations. Mennonites of Argentina were celebrating the centennial of the arrival of J.W. and Erma Shank and T.K. and Mae Hershey from Mennonite Board of Missions in the United States. John Lapp and Linda Shelly of Mennonite Mission Network in the United States and Nelson Kraybill of Mennonite World Conference brought greetings from their respective organizations. Mennonites of Argentina honour the early missionaries who sacrificed much to come to their country. But the focus of today’s church is on current and future mission. Mennonites have divided the country into four regions, with mission strategies and church planting for each area, and the church is growing. J. Nelson Kraybill is president of Mennonite World Conference.